Minar Levels Up! On the 10th of July, Minar had a birthday! We used to call him our "Artist Apprentice," but he's done so much fantastic art and animation for MechQuest over the past few years that we stopped considering him an "apprentice" long ago. Many happy returns of the day (and week, and month) to our very dedicated and extremely talented full-fledged Volunteer Artist, Minar! 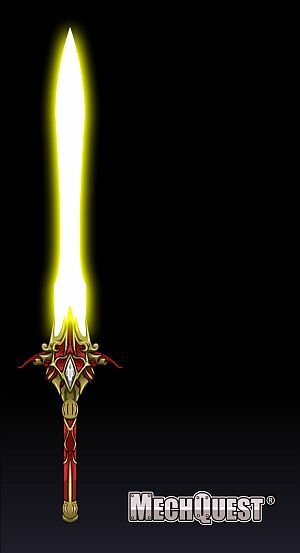 To commemorate this historic occasion, visit Soluna City to pick up an Ornate Energy Blade designed by Zoshi. Sneak Peek of Upcoming Addition to Light's Blades in Soluna City! 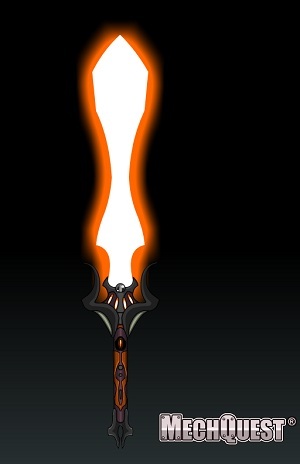 This one's called the Mafic Blade, and is part of a series by Blade! Bugfixes: There was a Gremlin in the Nemesis mecha that prevented you from moving from room to room in walkaround - that should now be fixed. Vivi figured out why the Male Star Captain uniform was popping up with a Battle Menu every time you went to sit down in class - that's also fixed. This wasn't really a bug, but I added a button so you can still access the mission from Braddock Steele after your progression in the War Camp takes you to a place where you have a "Previous Missions" button. March of the Shadowscythe Missions Continue: Report to the War Camp for a series of new missions! Are you really ALL ALONE out there??? Loads of new animated cutscenes, and FOUR new missions! Battle ON!